Anneville is a jewelry and metalworking studio and a jewelry co-work class space located in the Arts District at Liberty Station in San Diego, CA. Anneville Studio occupies Suite 209 and Anneville Jewelry Lab is across the hall in Suite 212 - both in Barracks 15. Aka mokume gane central, the studio is where all the mokume magic happens - fusing, fabricating, rolling, patterning etc. All of my mokume gane rings and vessels are made right here, using the solid-state diffusion bonding method. When not fusing mokume or creating finished mokume pieces, I am passing on the techniques of mokume gane to students in my ongoing metal arts classes and mokume gane workshops. Anneville studio is also where I meet with potential ring clients. It's a great place to see an overview of the mokume gane process, try on finished rings and discuss custom design options. I'm available by appointment and every first Friday of the month for the evening open studio event "Friday Night Liberty." At the Lab you will find classes, workshops, hourly bench rental, exhibitions, and networking opportunities. Join our community to work, learn and thrive. Learn more. I have been teaching jewelry/metalwork classes and creating custom mokume-gane wedding rings, jewelry and one-of-a-kind metal art objects since 1991. I earned my Masters of Fine Art in Jewelry/Metals in 1999, training primarily under Helen Shirk and Arline Fisch at San Diego State University. From 2003-2014 I taught a four-level jewelry/metals course at Southwestern College in Chula Vista. In 2007 I met a group of mokume artists working in Northern California - Toshiyuki Kawai, Earl Bushey, Jerry Blanchard and Gene Novagratsky. With them I learned to fuse, forge and pattern mokume gane using traditional Japanese methods. My work has been shown across the U.S. and in international venues such as the Deutsches Goldschmiedehaus in Hanau, Germany and the Tsubame Industrial Materials Museum in Tsubame, Japan. About rings | Bio and gallery. After working mostly alone in my home office since 2005 I was intrigued by the opportunity to provide part-time staffing, product development, graphic design and PR for Anneville and jumped at the chance. I started building websites and multimedia projects way back at the dawn of the interwebs and currently own Pixel Lava Interactive, where I help small business and nonprofits with their websites, graphic design and public relations initiatives. Now I'm applying that skillset to Anneville where I can work collaboratively with a group of inspiring, fascinating artists and fellow Liberty Station business owners. I'm looking forward to developing more creative work of my own as a result. When I'm not working I love gardening, lifting weights and being outdoors. Visit my site at PixelLava.com. Bio coming soon. Not really. She mostly just sleeps and chases squirrels. There, that's her bio. I founded my first San Diego studio, the Ray Street Annex, in 2007. It was a rustic cement-floored space, 150 square feet, wedged behind a gallery and looking onto a bustling street in North Park. It was there I first began creating custom mokume-gane rings for clients. 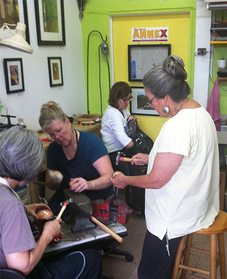 I also started teaching private classes (only 4 students would fit in that small space) on mokume gane and many other jewelry and metalwork topics ranging from fold-forming to hinged bracelets. The area’s restaurant and nightlife scene grew right alongside my business, and 2013 found me looking for more space and a quieter, more client-friendly environment. Thankfully I found the Arts District at Liberty Station, a non-profit organization dedicated to making the arts more available to all San Diegans. Now I work in a light-filled studio with free parking, elevators, custodians, suite numbers and windows that look out onto a grassy tree-lined promenade. Not to mention all the shops, events and amazing restaurants just steps away. It was a dream come true for this mokume gane artist! "Mokume gane patterning with chisels was one of the most enjoyable courses I've ever done."